Canon Law prescribes certain practices of piety for clerics that help keep alive the flame of faith and piety in the souls of those who must light and preserve that flame in others. 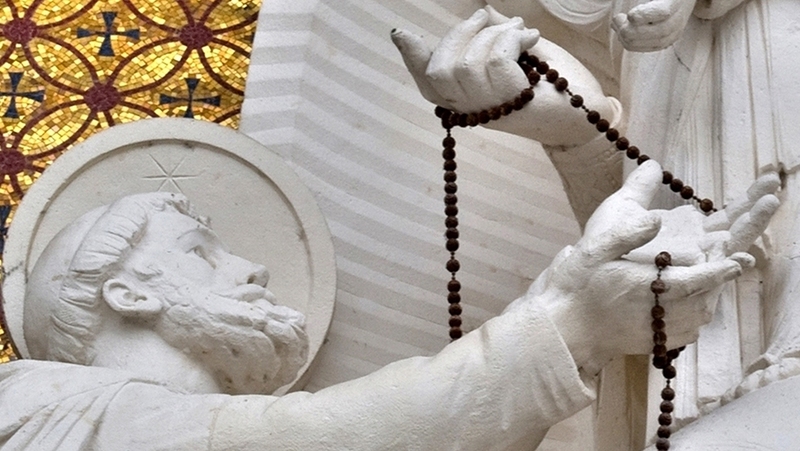 One of the main formulas of vocal prayer, made up of the most important prayers (Our Father, Hail Mary, Glory Be, Creed), is the Holy Rosary, which the Virgin Mary herself gave to Saint Dominic as a weapon for conquering the Albigensian heresy, and which she has since requested us to pray in her main apparitions, such as Lourdes and Fatima. For the seminarian, the Rosary is recited at the third time of community prayer during the day, and it is offered for the particular intention of the friends and benefactors of the Seminary. 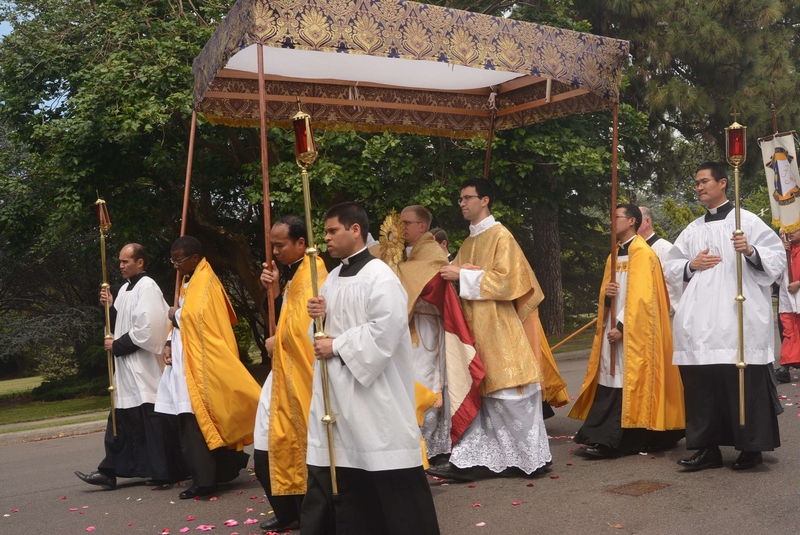 As the Society of Saint Pius X has a great devotion to the Holy Mass, seminarians must acquire a great love and veneration for their Eucharistic Lord. For this purpose, at certain times of the year, there are expositions of the Blessed Sacrament as well as all night adoration. Seminarians also become accustomed to making visits to the Blessed Sacrament during the day. Charity is acquired by steadfast effort and by continual prayer to our Lord. We cannot hope to receive all of the graces which are going to transform us in the charity of our Lord if we do not pray and meditate and ask our Lord Jesus Christ for them. Archbishop Marcel Lefebvre, Priestly Holiness, p. 63. St. Jerome, when instructing Nepotianus on the priestly life, said: "Never let the sacred book leave your hands"; and he gave the following reason for his advice: "Learn that which you are to teach; holding to that faithful word which conforms to doctrine, that you may be able to exhort with sound doctrine, and refute the opponents." What great advantages are gained by priests who are faithful to this practice! With what unction they preach Christ! Far from flattering and soothing the hearts and minds of their audience, they stimulate them to better things, and arouse in them the desire of heavenly things. Pious books solemnly remind us of our duties and of the prescriptions of legitimate discipline; they arouse the heavenly voices that were stifled in our souls; they rid our resolutions of listlessness; they disturb our deceitful complacency; they show the true nature of less worthy affections to which we have sought to close our eyes; they bring to light the many dangers which beset the path of the imprudent. They render all these services with such kindly discretion that they prove themselves to be not only our friends, but the very best of friends. They are always at hand, constantly beside us to assist us in the needs of our souls; their voice is never harsh, their advice is never self-seeking, their words are never timid or deceitful. Every night, before going to sleep, ask your conscience to be your judge, ask it to give a very exacting account of the bad decisions that you took during the day. Root them out, destroy them, and chastise yourself on their account. This is the examination of conscience, which purifies the soul each day so that it might always progress in his life of union with the Divine Master. Besides their examination, seminarians go to confession once a week. The sacrament of Penance is the divine remedy for overcoming sin, for curing the weaknesses of the soul and for making progress in the spiritual life. Spiritual direction is also of assistance to the seminarians. Through it, the prudence of the priest helps them advance diligently and wisely along the paths of Christian perfection. Another means to grow in grace and pursue a constant amendment of life is spiritual exercises, also known as retreats. Seminarians attend retreats frequently during their formation. They have an annual retreat of five days at the beginning of the academic year, a monthly recollection around the first Saturday of the month, and retreats of varying length before the reception of orders.